What better way to celebrate Labor Day than to come to the Smokies, and relax in the PERFECT weather for enjoying the great outdoors! It’s still warm enough to swim, but it’s starting to get cool enough to enjoy hiking, camping, cookouts, and more! Get a peek into local culture! 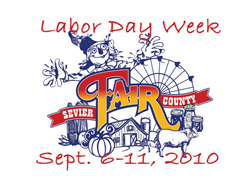 Visit the Sevier County Fair while you’re here in the Smokies! Enjoy fair rides, food vendors, livestock and gardening competitions, a beauty contest, live music, watermelon seed spitting contest, and much much more!! For more information, visit their website! Visit Splash Country for their last weekend of the season! They will be open Saturday through Monday that weekend! Enjoy one last weekend of thrilling rides and slides, or soaking in the wave pool or lazy river. Or maybe you just want to bring your kids and lay out in the sun! Enjoy the prime season for hiking in the Smokies! It’s the perfect temperature for hiking. Start early in the morning for the best hiking weather. Make sure to bring plenty of water and appropriate snacks to keep you going! Avoid hiking alone, and be mindful of the wildlife around you! When choosing what trail to take, consider what you hope to see (flowers or other beautiful plants, animals, waterfalls, expansive mountain views), how steep of a hike you can handle, how long of a hike you can handle, how long it will take, etc. For more information, visit the Park’s website, or stop in at the Sugarland’s Visitor Center. Go horseback riding! Take your pick of riding stables in the area, and enjoy the flora and fauna of the Smokies from the back of a trusty steed! Maybe you would rather take a carriage ride? Got it! Want something even more unique? Try a camel ride! Have a picnic in the Park! Pack sandwiches and chips, bring your own meal and grill out, or pick up lunch to go from your favorite restaurant! No matter how you slice it, a picnic is super fun! There are 10 different first-come, first-serve picnic areas. Big Creek, Cades Cove, Chimney Tops, Cosby, Greenbrier, Deep Creek, and Metcalf Bottoms are open year-round. And there are 3 other picnic areas that can be enjoyed during this warm and sunny season! If you love shopping, go on over to the Labor Day Weekend Sidewalk Sale at Tanger Outlet, and hit the stores! The Tanger Outlet offers over 100 band name stores just off 441! 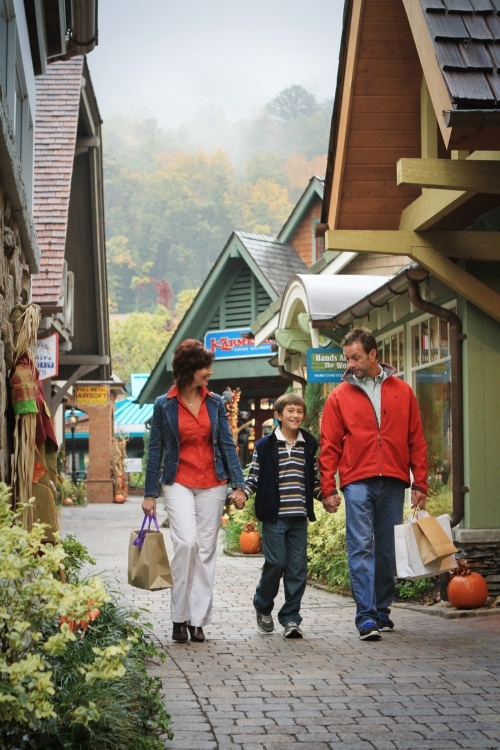 Tanger is probably the favorite shopping destination in the Smokies of most of the people I talk to! It includes every type of store you can imagine, as well as a few delicious places to eat, and right next door is the Ripley’s Old MacDonald’s Farm Mini-Golf, where you can drop off the members of your family who don’t enjoy shopping while you hit the stores! And saving the best for last… rent a luxurious log cabin with a gorgeous mountain view! Cook out on your own charcoal grill, enjoy the view from rocking chairs on the porch, or maybe from your hot tub. If it rains no worries! Come inside and enjoy TV, comfortable surroundings, and maybe even a game room with a pool table, foozball table, or who knows what else! 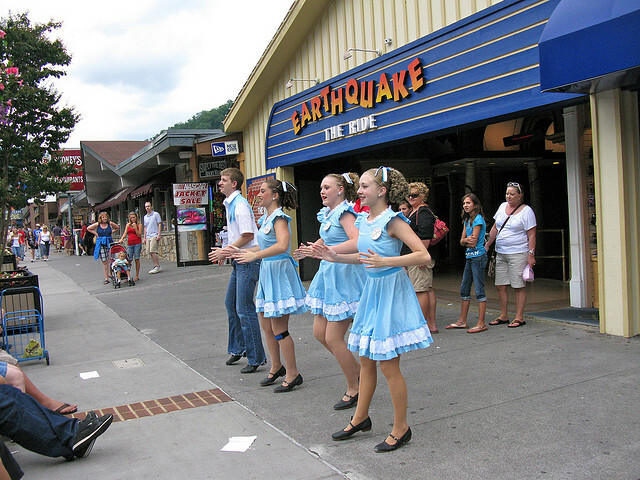 GATLINBURG: Be a Friend of the Smokies–Vote Today! Please vote for Friends of the Smokies. Help them WIN a “Tourism Cares” grant, please!!! Friends of Great Smoky Mountains National Park assists the National Park Service in its mission to preserve and protect Great Smoky Mountains National Park by raising funds and public awareness, and by providing volunteers for needed projects. Friends of the Smokies is an independent, 501(c)(3) non-profit organization. All donations are tax-deductible as allowable by law. Wherever you go in the Smokies, you can see the results of their collective efforts, but they still have a lot more work to do. Please help us help the Smokies. Click Here to vote! It takes 2 seconds and does not ask for your email address… PLEASE vote for FRIENDS OF THE SMOKIES. Thank you! This grant could be worth $5,000 to $10,000 to support historic preservation in Great Smoky Mountains National Park, plus the additional publicity for Friends of the Smokies, and increased awareness of our Park’s needs.